These are used to keep the pilot, his aircraft, the parking staff and the spectators safe during our reunion. For all descriptions of Wynkoop Airfield (6G4) runways, aircraft or vehicle parking, spectator areas and other information, refer to the Reunion aircraft parking plan. 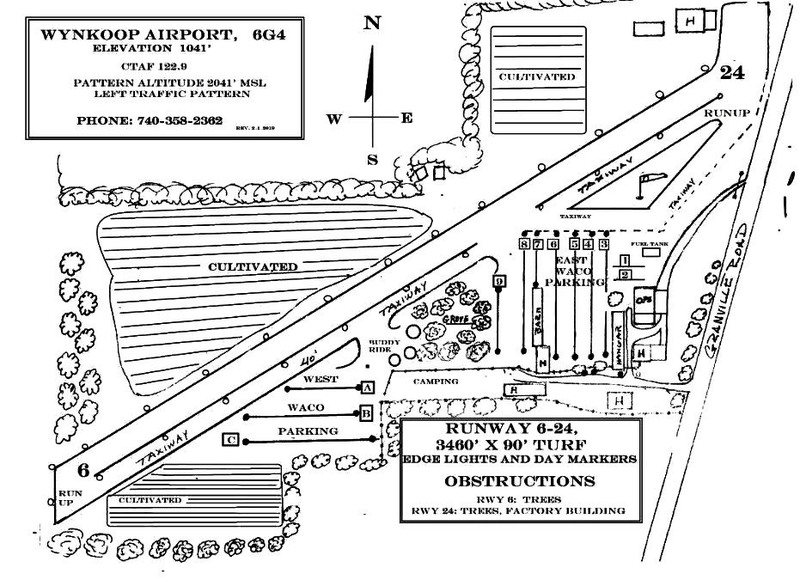 The aircraft parking plan for the NWC Reunion at Wynkoop Airfield (6G4). During the Reunion runway 6-24 will be in use and left hand traffic applies for all operations. Traffic pattern altitude is 2041’ MSL. The Unicom frequency / CTAF is 122.9. This frequency will NOT be monitored during the reunion. If you are using a radio, make your radio calls in the blind. Yellow day markers define the boundary of runway 6-24 and lights are on at night. Runway 6-24 can be accessed from a full-length parallel taxiway located on the south side of the runway. The parallel taxiway is accessible from any point along the runway but beware of the edge markers and lights. Run-up areas are on the south side of the runway at the threshold ends. Runway 24 departures are not to taxi across runway 24 and then depart from the north side as a very large tree blocks the final approach view. This will help prevent an aircraft pulling out in front of someone that is on short final. The taxiway boundaries, parking exit/entrances and known hazards are marked with orange and yellow cones. Download Reunion aircraft parking plan for parking layout. There are two parking areas; “EAST” and “WEST”. Rows 1-2 are spaced for small “F” types (RNF/ KNF/PBA). Rows 3-4-5 are spaced for open types larger than RNF/KNF. Rows 6-7-8-9 are spaced for all cabin types. Rows “A”, “B” and “C” west of the “Grove” will accommodate any type WACO. The head of each row is marked by a yellow sign displaying the row number or letter in black with the row separated from the taxiway by orange cones. Parking spot numbers in each row begin with #1 at the taxiway end and increase as you move south or west in the row. Parking is on a first come, first served basis. Upon arrival plan to clear the runway onto the parallel taxiway. Once on the taxiway taxi toward the center parking entrance and watch for a marshaller in an orange safety vest. This person will direct you to the “Follow Me” golf cart that will lead you to your parking spot. The “Follow Me” cart is marked with a “FOLLOW ME” sign and orange and white airfield hazard flag. DO NOT CLEAR THE RUNWAY AT THE EAST PARKING ENTRANCE OR STOP IN THE ENTRANCE TO THE EAST PARKING AREA AS THIS PRESENTS A HAZARD TO OTHER AIRCRAFT. CLEAR ONTO THE PARALLEL TAXIWAY. As you taxi in wing-walkers wearing orange vests and carrying orange wands will meet you at the beginning of the parking row to assist with wing tip clearance while taxiing. Wing walkers will use standard hand signals found in Chapter 4 of the AIM. The cart driver will marshal you into your parking spot or have you shut down parallel to your row, depending on the proximity of other airplanes. If stopped parallel to the row you will be assisted in pulling your ship into its spot after shutdown. Marshaller will be using standard hand signals found in Chapter 4 of the AIM. After parking you will be handed a yellow card numbered to match your parking spot. Tiedowns are mandatory. After arriving please put your tiedowns in and have your aircraft tied down anytime that you are not at the airport. The yellow card that you are given has your parking spot number printed in black on one side and a red “FUEL” printed on the reverse. For example: a yellow card with the number 33 on it indicates that you are parked in row 3, spot number 3. Use this card when returning from flying by showing the black spot number to the dispatcher/wingwalkers. This will tell them that you already have a spot and they can radio ahead to tell the parking staff where you are going so that they can meet you and assist you back to your spot. When available a golf cart will lead you, but if they are busy working new arrivals just head for you row and look for the wingwalkers to assist you to your spot. Plan to stop parallel to your row and be pulled into your parking spot. Display the red “FUEL” side of the card to the dispatcher and in your windshield if you desire fuel service. Wingwalkers will be available to assist in moving your airplane out of its parking spot prior to start up. If they are not there just ask anyone in an orange vest for help. Wingwalkers will assist, at your request, in clearing your propeller area prior to start. They will assist with wing tip and spectator clearance until you exit the row onto the taxiway. Please use wingwalkers while taxiing in the parking area. Avgas and oil service is available for the duration of the reunion at your parking spot from a fuel truck staffed by National Waco Club volunteers. Fuel tank service is for transient airplanes. The hours for this service will be 0800 until 1700 Tuesday through Friday and 0800 until 1600 on Saturday. Regular Wynkoop Airport Fuel service will resume on Sunday morning and the NWC staffed fuel truck will be available if there are enough volunteers to safely man the truck. Display the red “FUEL” side of your parking card in your windshield to help the fueler find you. Fueling will not take place without the owner/pilot present. At the completion of fueling you will be asked to sign the receipt and then you will be given a copy of the fueling receipt with the total gallons and airplane registration number noted. Payment for your fuel is by taking your receipt to Brian Wynkoop at the airport office. Payment is by cash or check only. Mr. Wynkoop does not offer credit card services in an effort to keep the fuel prices lower. Check with Mr. Wynkoop about running a tab of all receipts during your stay if you wish to make just one payment when you are ready to go home. There is a white line painted on the ground along the north side of the Waco parking area. At Mr. Wynkoop’s request please do not walk across this line to get closer to the runway. Also, if you see anyone cross it please let them know that they are to stay behind the line for their safety at the airport owners request. Hangar space is NOT available at Wynkoop Airport. If you desire hangar space please make your own appropriate arrangements with any of the satellite airports in the area. Left hand patterns only. Do not pass other aircraft in the pattern. No aerobatics over the field. Use one of three designated ride circles on west side of grove. If you leave your engine running during loading, then you must have a designated helper escorting your passengers to/from your aircraft. No ride hauling for hire. Do not walk across runway 6-24.
f access to north hangar is required then cross runway only at the east end along Granville Road.